This may have been my favorite of the three beers I tried from Neighborhood Beer Company. They describe it as a light brown ale which is a fair description of the appearance but it certainly does not taste like an American Brown Ale. Appearance is a deep copper which could be considered light brown with a finger thick white head. Aroma was pretty light but what was there was bready and pleasant. Taste was also malt forward but relatively light for a brown ale style. You don’t get the big roasted malt or nutty flavors often associated with a brown ale but you do get a malt forward beer that is super smooth and easy to drink. Really enjoyable but from a style that I don’t drink often so not something that I will seek out again. Brewers Description: Alien Garden Light Brown Ale is a smooth and refreshing style featuring a nice herbal finish. This well-balanced ale is made in the style of a Westphalian country ale from western Germany. A limited release style, get your Alien Garden now because it might never return. 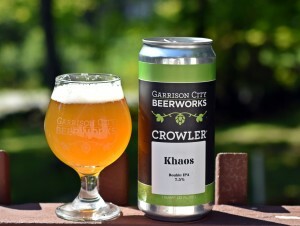 I have been really enjoying the variety of low ABV and very flavorful beers being introduced by many breweries which includes several gose style beers. 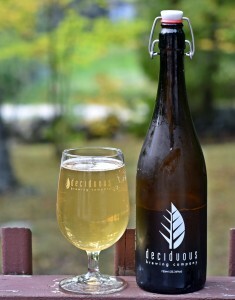 Aggregation from Deciduous may be the lowest ABV gose so far at only 2.4% ABV. Love the clean pale yellow of this beer with only a small halo of a head, pretty typical of the gose style. Aroms is a great mix of spice and lemon. Taste is slightly tart with more lemon than coriander and very little salt coming through. 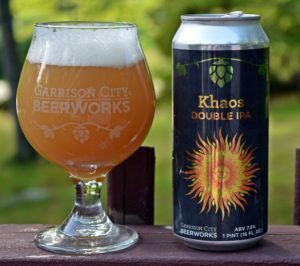 A super easy drinking beer that you can enjoy any time of day and also have more than one without having to worry about driving home. Really excellent beer and looking forward to trying Cumulation their gose at 4.5% ABV. Brewers Description: Our interpretation of a Table Gose. Brewed with acidulated malts, 60% white wheat, fresh coriander from Stock & Spice in Portsmouth, NH, and sea salt varieties from Salt Cellar in Portsmouth, NH. Think a gentle lemonade made with Moroccan preserved lemons. 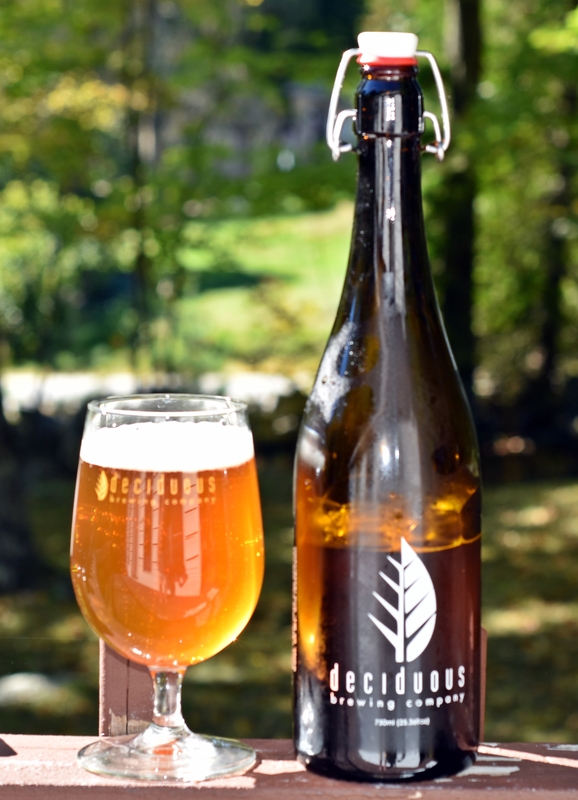 Another beer from the recently opened Deciduous Brewing in Newmarket, NH. This is their wheat IPA, Agricultural. Too sunny when I took this picture but you can tell the beer pours a very clear orange with bright white head. Aroma was muted with a bit of melon. Flavor was also a bit disappointing with a sweet start and a big bitter finish that lingered. No question this is a well made beer but it is just not what I like from my IPAs. Brewers Description: Our interpretation of a wheat IPA. Brewed with golden promise and red wheat, hopped with Amarillo and Hull Melon. 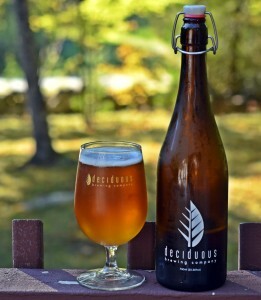 The first of three consecutive reviews from Deciduous Brewing in Newmarket, NH. This one is their pale ale – Aerophyte. This is a beautiful beer with a deep orange color, thin white head and very clear. Aroma is grassy, herbal and slightly sweet. Taste was OK with some peppery spice, floral, big sweetness and the finish is more bitter than I expect from a pale. Overall a well crafted beer just not the hop profile I prefer and a bit too bitter in the finish. 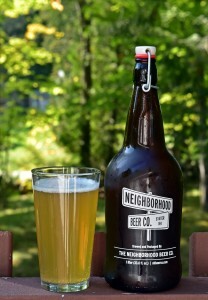 Brewers Description: Our interpretation of a New England styled Pale Ale. Brewed with 2 row barley, crystal malts, tc8570, and dry hopped with a hallertau variant. Neighborhood Beer Company recently opened their brewery and tasting room in Exeter, NH. Their focus is on authentic German style beers often made with a slight American twist. These are types of beers that are not brewed often in the US so don’t expect any American IPAs or DIPAs when you visit, at least to start. This blonde ale is based on the traditional Kölsch style. It pours a clear yellow with minimal head that dissipates quickly. Aroma is sightly sweet with a bit of yeast and bready malts. Taste follows with a nice light body and low carbonation. Overall an enjoyable first beer from NHBeerCo that won’t disappoint but also won’t get a lot of attention when so many are looking for the next big hoppy beer. Brewers Description: Hallowed Hammock Blonde Ale is a smooth, easy-going pale ale based on the acclaimed Kölsch beers of Cologne, Germany. Clean tasting with subtle hints of caramel, vanilla and apricot as well as lingering notes of white wine from a scarce German hop variety, this beer is as easy drinking and relaxing as it gets. 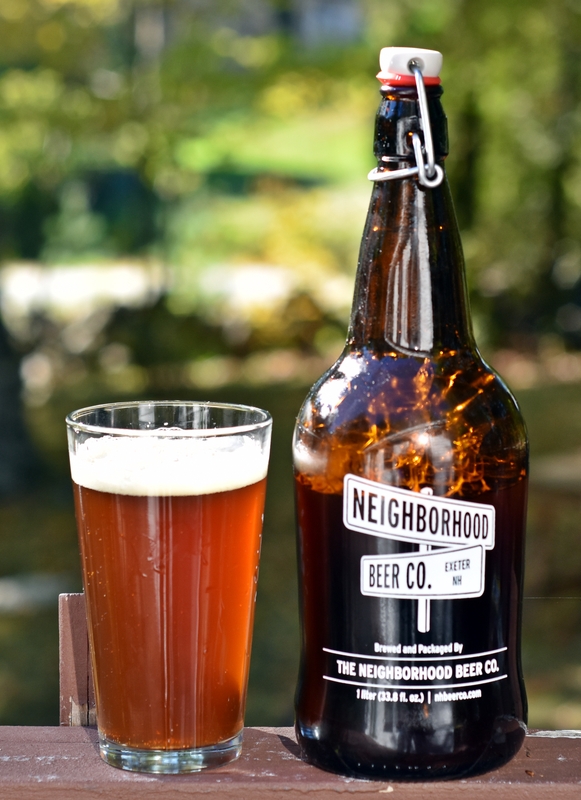 For the beer geeks amongst you, this full-flavored, hand-crafted ale has 4.9% ABV, 24 IBU, and 4 SRM. Updated review with photo of the 16 ounce can. Compared to the original review this beer is a lot thicker than the last photo I took. Khaos is the 9th beer I have reviewed from Garrison City and all have been very good. Most have been hop forward pale ales, IPAs or double IPAs which are a few of my favorite styles. Color is a little lighter Anomalous, the other DIPA I have reviewed from GCB, but still has the slight haze and bright white head that most of their other beers have. Aroma is nice mix of tropical fruits and pine. Grapefruit, citrus, lemon, pine and a bit of grass are all present in the taste making this a very complex and flavorful beer. Resinous finish with a fair amount of bitterness that lingers in a good way. Overall another excellent beer from GCB and this one will be available in 16 ounce cans soon. I know Mike from GCB reads these posts so I want to assure him this beer was consumed when Calypso was pouring at the brewery 2-3 months ago. It just took me that long to pull together the photo, info, etc. 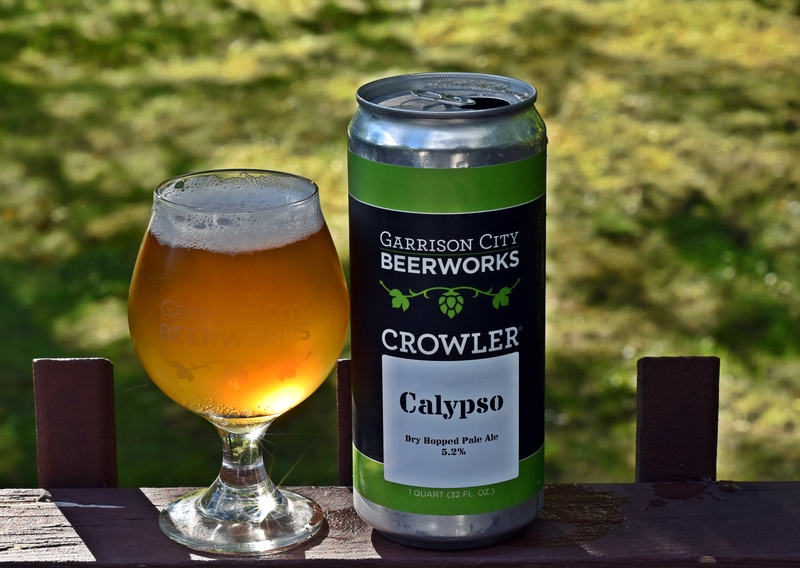 Calypso is another in a series of single hop pale ales from Garrison City, you can read about the others here; Mosaic, Galaxy and Citra. Galaxy and Citra continue to be my favorites but all are solid beers. Appearance is a little lighter than the others with a nice white head that left plenty of lacing. Aroma was mild with a bit of tropical fruit. Taste was great with a nice malt base, some tropical and peach flavors coming through. Lots of flavor for a relatively low ABV beer and a slightly bitter crisp finish make this one super drinkable. Overall really enjoyed this beer but the Calypso hop just doesn’t pack the same punch as Citra or Galaxy. Still worth a shot when it comes back around. Brewers Description: An unfiltered, dry hopped American Pale ale brewed exclusively with Calypso hops. The first of four beers that I brought home from Deciduous Brewing. 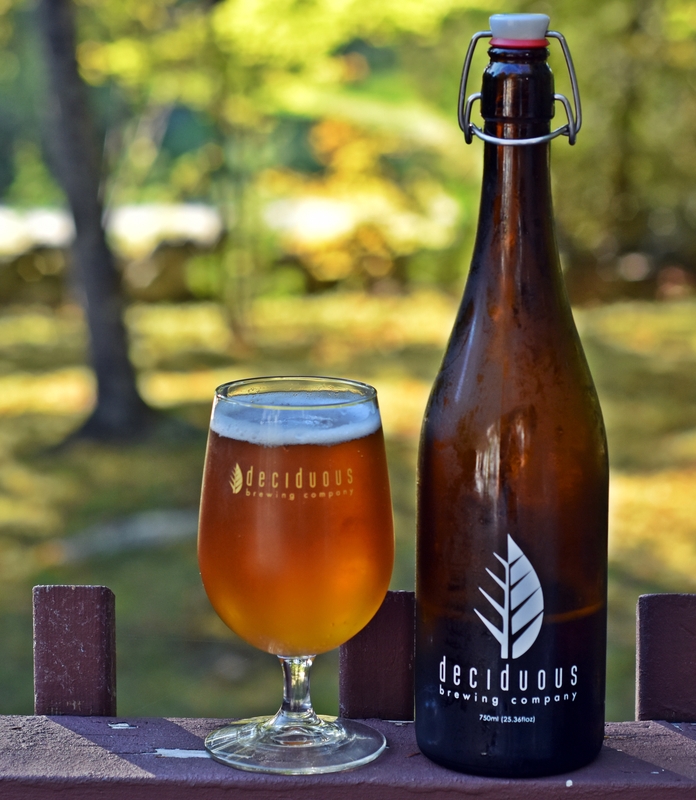 For those that don’t know Deciduous is a new brewery in Newmarket NH and David Sakolsky, formerly of Blue Lobster, is the brewer. I always enjoyed David’s beers at Blue Lobster so I was quick to stop by the new spot when they opened. 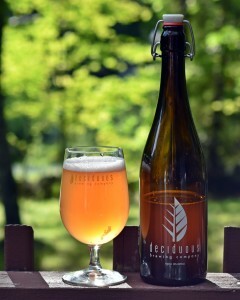 Auroral is the first beer released from Deciduous and is a Berliner Weiss style beer with blood oranges and lychee. I had never even heard of a lychee before this beer so no idea what it added to the beers flavor. This beer is off to a great start with a deep yellow, slightly hazy appearance and active carbonation that leaves a nice white head. Aroma lets you know this is a berliner with a nice mix of light funk and fruity citrus/lemon. Taste follows with a nice base fruit juice start and enough pucker to make you smack your lips but it won’t make your eyes water. Finish is clean and refreshing. 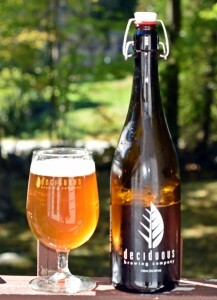 This is a well done beer and if you like the style than you will certainly enjoy this one from Deciduous. Brewers Description: A Berliner style wheat ale brewed with acidulated malts, blood orange and lychee. Small update to the post with the new 16 ounce packaging which most GCB beers are going into these days. 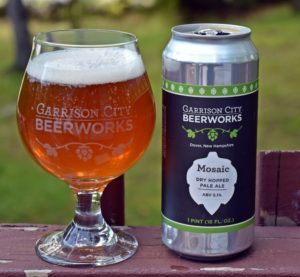 Another excellent beer from Garrison City Beerworks and another beer that focuses on Mosaic hops. This continues a trend that includes; Hill Farmstead’s Mosaic Pale Ale, Trillium’s Mosaic Dry Hopped Fort Point, SoMe’s Apostrophe IPA and Mozaccalypse from Stoneface. Lots of options for fans of Mosaic hops. Garrison City’s Mosaic Pale Ale is another in a line of pale ales all coming in around 5% ABV and all very flavorful. Appearance is a deep orange almost red with an off white head. Aroma is quite sweet with some nice tropical, lemon and citrus notes. Taste starts with those sweet malts but moves quickly to the fruity hops. Lightly carbonated, almost no bitterness and a very dry finish make this one super easy to drink. Another excellent beer from Garrison City. Brewers Description: Mosiac Dry Hopped Pale Ale. 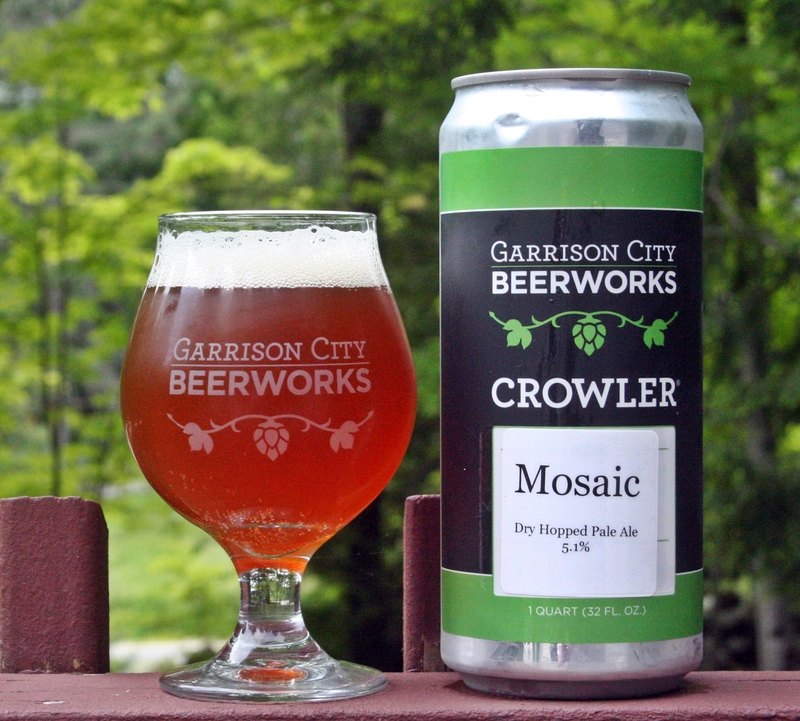 A Pale Ale bittered, flavored, and dry hopped exclusively with Mosaic hops. Flavor and aroma of pine, citrus, blueberry and pear. Medium body with a dry bread malt finish.